I’ve been observing a lot of discussion related to the topic of social networking. During the last few months, I had the chance to discuss this topic with many people – customers, vendors, analysts. We have seen many product announcements in this space from many vendors – general IT software providers (Microsoft, Oracle, and IBM), PLM providers (PTC), and some others. In my opinion, there is a significant blur around social networking and how “everything social” influences and impacts Product Lifecycle Management in general, and collaboration more specifically. I strongly believe that as social networking is terms emerged from the consumer space, it needs to be carefully transformed for handling by enterprises in general and manufacturing organizations specifically. 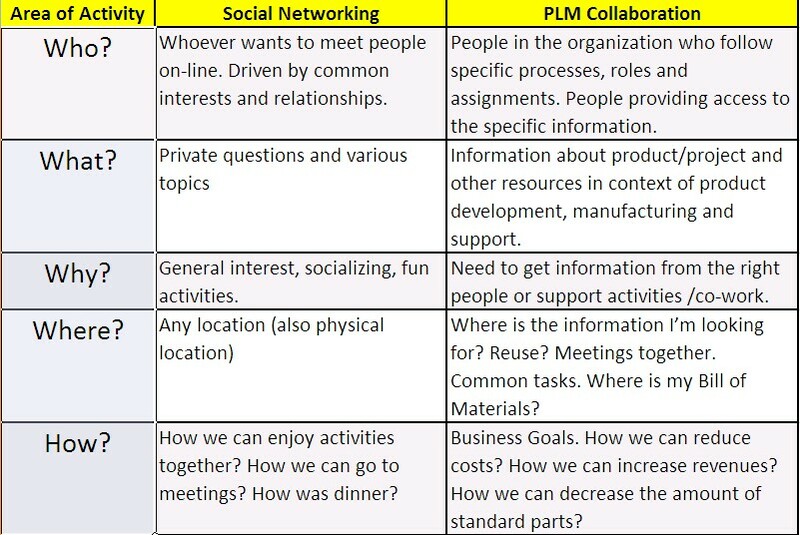 As my first exercise, I will compare the differences and similarities between social networking and PLM collaboration according to five questions – Who?, What?, Why?, Where?, How? So, to conclude my take on differences between social networking and PLM collaboration, I have to say that they have a lot in common. Although goals, objectives and audience are different, they both will have similar communication and user experience. Regarding business logic, it needs to be different. Especially for enterprises and manufacturing organizations, being able to support the right business processes and corporate activities is very important. One thing I like about your blog is that you see things through different eyes than me. It keeps me thinking. My table would have been much different but to keep me from writing my own blog post here, lets just look at the “What”. “Social networking” – outward search for information and human interaction. “PLM Collaboration” – inward search for information and human interaction. If you want, one is more “extrapolation”, the other is more “interpolation”. Hello Mark, Thanks for your comments! With regards to your “what” – I understand your point about extrapolation vs. interpolation. However, how you define ,for example, supply chain activity. Is it in-/or/ex-? At first glace, it seems logical comparison. But, more important issue is how will social networking affect PLM systems and how they facilitate collaboration and meet the business goals. 1) Re-use. The current classification based or other features seems a major difference. 2) Publishing of usability of a product module is not as good as in social networking tools. For example, as a consumer I can say that I am interested in hiking. PLM tools defines what the product module is which is equivalent to defining me, but a lousy job defining us-ability. A module should be able to publish itself the way I can publish myself. “In or Ex”? I guess you have to define what we are talking about to know if we are inside out outside. I don’t think “in” means “internal to the company” and “Ex” “external to the company” although it might in some cases. In your example “in” might be Internal to the supply chain. How can the actors in the supply chain collaborate for higher productivity, quality, speed, etc. The “ex” is more a point of view of standing in your supply chain and looking out. Finding others with similar problems in other supply chains, getting ideas for future supply chains, hooking up with supply chain experts you didn’t know were out there, finding answers to questions you didn’t even think to ask are all things that might fit on the social computing side. Of course, I’m just hypothesizing. I am in no way a supply chain expert! Hello Nawal, thanks for your insight! Re-use and publishing are very important things that can connect product-related space with social nets… especially I see importance of publishing and all what related to something called downstream usage. usability is obviously hot topic there, since almost all today’s tolls are bellow any reasonable level of mass usage outside of eng. department… Best. Oleg. It occurs to me that there is something fundamentally different between collaboration and social networking. In the construct of a business, people expect to be held accountable, and as such, they are measured in how they interact (particularly when they know their actions can/will be documented). When I look at Facebook, MySpace, and Twitter, I see a lot of people that aren’t thinking about their actions/words being traceable and auditable. So I wonder if introducing social networking constructs into business will increase collaboration, or limit it (because people are afraid to be spontaneous and creative when they know they are being watched/recorded). Jonathan, for me, main point is that social networking facilitate communication. And we need to figure out where it make sense for business communication. People are using Twitter, Blogs for business. So, question if we can leverage power of social net for enterprises. Jonathan brings a good point. Social networking usefulness may dependent on where we are at in the PLM process. For example, in earlier phases – where the cost of change is low – this uncontrolled collaboration can bring lot of value. but, as we move towards, the later phase and cost of change increase significantly, the current mode of operation is more suitable. Another way to think about is a product development culture among start-up companies in silicon valley. Social networking tools would be more suitable in those scenarios. But, as these companies get mature and gobbled by giants like CISCO etc, the traditional tools takes over. Obviously, you can have the start up culture in some part of a mature organization. This raises the question of what would be the interface, interaction and modus operendi between social networking type business tools and the traditional business tools. I can think of an example, when I started working, we had a facility which was located in a single physical location. Me being in manufacturing, if I had a change, I would just take a drawing – physical print – walk over to design department. Discuss the change informally. The change process was a mere formality to capture what we agreed to. In many companies, PLM system has replaced the final formality. The informal process still happens over email, phone-call, web-ex, chat or over a cup of coffee. But PLM tools play very little role in facilitating or capturing, for future use, the informal process. The quality of informal discussion is critical in terms of knowledge generation and reduction of the time to implement change. This is an area within Change where I would see social networking or enterprise 2.0 bringing in lot of value. I agree. The goal of ultimate PLM tool is to enforce business rules and contraints in a non-invasive way, kind of like invisible to a user. Current systetm are lacking in this regard. Nawal… I used this term already few time -Invisible PLM. actually like it :).. Great discussion! Thanks!